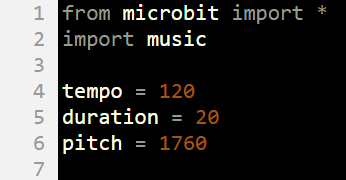 micro:bit projects: set tempo with a metronome! @microbit_edu #microbit #microbitlove #microbitmonday « Adafruit Industries – Makers, hackers, artists, designers and engineers! Using technology in music is totally will.i.am’s jam. Computers have made it much easier for musicians to perform and produce music, even in really simple ways. When working with singers, sometimes will.i.am will make the performance interesting by using a faster or slower tempo than normal. In cases like that, making sure everyone is keeping time is definitely important – we can use the BBC micro:bit as a metronome and make sure everyone can keep the beat. Fancy mechanical metronomes have a large swinging arm so you can see and hear when the beat is, as well as make the tempo faster or slower.